As promised these completed flute blanks will start hitting our inventory pages starting later today. Included in this lot are 4 – 1 inch bore Black Willow blanks, two 3/4″ bore Western Red Cedar, 3 Alaskan Yellow Cedar Blanks in 1inch and 7/8″ bore and several Alaskan Yellow Cedar Billets and two beautiful Port Orford Cedar blank sets that have not been bored. In this lot most of the blanks in addition to the bore and blow holes being cut we have decided to cut just the focusing channel and the exit hole from the Slow Air Chamber. We DID NOT cut a starter hole for the Cutting Edge. We have received several requests lately to leave this area alone as more and more flute builder want to tackle the Windway/Cutting edge themselves. Look or them on our Pre-Bored Flute Blank pages and our Blanks, Billets & Boards page. After many months and a big move the past year to our new little ranch here in Wyoming we are bringing back Blanks, Billets and Boards to Jacksonholetim.com. A big part of our business in the past has been selling quality hard to find specialty lumber available in very small quantities. Our motto here is WASTE NOT. There are so many boards that have issue with them such as knots, checks, splits and just damaged areas. Plus it is hard to find a place where you can purchase just one single quality board. Some of the best blank sets come from these very challenged boards. We take the time to cut each board to its full potential and then cut, plane and drum sand them so others including ourselves can use them. Some of the species we like such best are Alaskan Yellow Cedar and Port Orford Cedar which both are hard to find and expensive to obtain. We also like to keep a smattering of odd species such as Russian Olive, China Berry, Black Locust and others. We are adding daily new inventory as of the date of this post. We have changed the name of our “Ready To Bore” blanks page to “Blanks, Billets & Boards” and you now can find the link to this page from several places within our menu system. 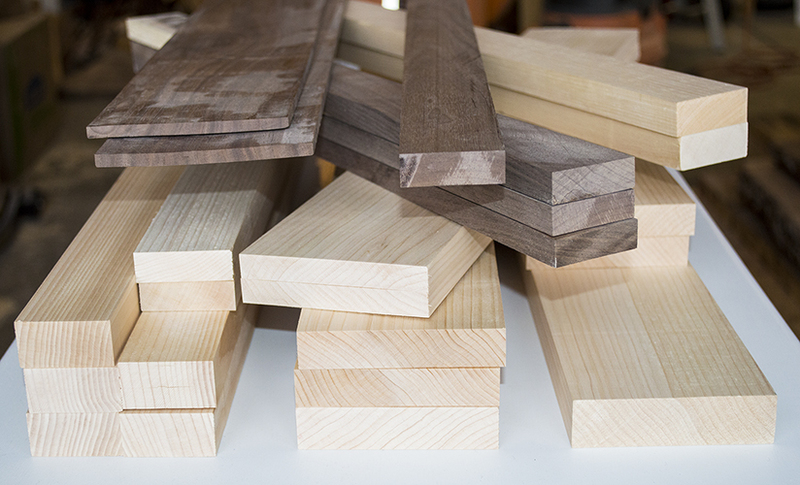 You will find pre-cut ready to bore flute blank sets, solid billets, and pre-cut and surfaces quality lumber boards. This page should be of interest to more than just flute makers as the billets are perfect for lathe turners, and the boards are first rate lumber. Most of our stock will be in lengths less than 60 inches in length but this is subject to change. I hope that you will find this new inventory listing helpful in your project – whatever it may be. For flute makers that craft their own flute blanks you will find some very nice board stock much of it in the 6 – 10 inch widths. If you are cutting your own or wanting to cut your own flute blank stock this is a great way to go. To be truthful when we cut a board we always seem to look at it for it flute blank potential. Enjoy shopping. As I write this post we are adding 15 new Pre-Bored Native American Style flute blanks to our Pre-Bored Blanks for sale page. In this batch there are 3 26″ long China Berry blanks bored with a 7/8″ bore. One Old Growth Port Orford Cedar blank 28″ long and a 7/8″ bore. One 30″ long Old Growth Alaskan Yellow Cedar 30″ long. There are five 1″ bore Port Orford Cedar flute blanks all five are 30″ inches long. Finally we have added five more 24″ long 7/8″ bore Alaskan Yellow Cedar blanks. All of our blanks are individually shrink wrapped to help maintain the quality of the blank before and during shipping. Each blank list on our Pre-Bore Flute Blanks Page are listed individually and the picture you see is the actual blank you are purchasing. All 15 will be identified with the tag NEW in the listing. ALL of these new blanks are first-rate blanks and the Port Orford Cedar blanks are some of the best I have cut in a long time. Check them out. Spring Break in Jackson Hole is a welcome time of the year as we are emerging from the depths of Old Man Winter here in Western Wyoming. Each Spring our kids get 2 full weeks for Spring Break which is plenty of time to take a road trip. This year a road trip south was needed more than other. Our epic snowfall was one for the record book and it was still falling upon our departure. This year our road trip was to take us first to Scottsdale Arizona to visit family and then on to San Diego. One of the highlights planned was to visit a Scottsdale venue where Tony Duncan was to play. For those who may not know Tony Duncan is one of our true Native American Music treasures and he is an Award Winning Native American Flute Artist and World Champion Hoop Dancer (5 times World Champion). Tony has been blessed to play with the likes of Carlos Nakai, Joanne Shenandoah, Nelly Furtado and other great music artists. He was awarded Artist of the Year at the Native American Music Awards for 2013-2014 and he has played to huge audiences globally. Tony has played the Kennedy Center for the Performing Arts, The Smithsonian Museum, The Billboard Music Awards, The Tonight Show, and The White House. The Native American Flute is one of the most beautiful instruments handed down from Mother Earth and when in the hands of Tony, well lets just say a Spirit comes through and straight to your heart. Recently I had the opportunity to deliver a flute I made to Tony. Although this flute took a bit longer than I had wanted I finally was able to have it delivered before our trip to Arizona. The flute pictured above is the actual flute crafted for Tony and above (picture) is a link of a video sent to me by Tony of him playing it in Arizona shortly thereafter. We arrived in Scottsdale late Friday evening after driving 900 miles. Then Saturday morning we made our way down to the Scottsdale Civic Center just in time to hear Tony play and to our great surprise he was playing his new Raven Themed flute. This man is blessed for sure. We met his family again and chatted a bit about things and after the show we parted ways and our family went on to eat lunch in town. But I must tell you how humbled I was to hear the voice of this flute after spending so many hours crafting it. Tony could not have been more gracious as was his wife Violet. And his children are so full of life and clearly one big happy family.